Specific Gravity is the ratio of the weight of anything to the weight of water. The pressure pushing against atmospheric pressure on liquids at elevated temperatures. A Suction Head exists when the liquid is taken from an open to atmosphere tank where the liquid level is above the centerline of the pump suction, commonly known as a Flooded Suction. A Pump Performance Curve is produced by a pump manufacturer from actual tests performed and shows the relationship between Flow and Total Dynamic Head, the Efficiency, the NPSH Required, and the BHP Required. A Centrifugal Pump is a variable displacement pump. The actual flow rate achieved is directly dependent on the Total Dynamic Head it must work against. The performance of a centrifugal pump is affected by a change in speed or impeller diameter. 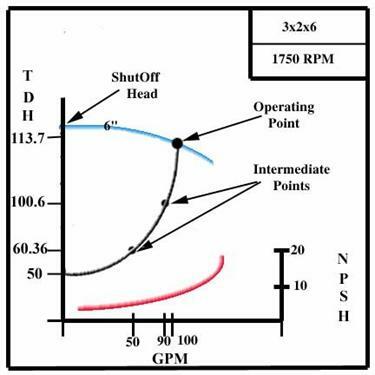 To Calculate a System Head Curve several points must be chosen to calculate friction losses on both the suction and discharge sides of the pump at various flow rates. The static suction head/lift and the static discharge head remain constant. The net positive suction head required is a function of the pump design at the operating point on the pump performance curve. The net positive suction head available is a function of the pump suction system. The Net Positive Suction Head is the absolute total suction head in feet. Atmospheric Pressure (-) Vapor Pressure (+) Liquid Height (-) Friction in the Suction Line. Atmospheric Pressure (-) Vapor Pressure (-) Liquid Ht. (-) Friction in the Suction Line. Suction Cavitation occurs when the pump suction is under a low pressure/high vacuum condition where the liquid turns into a vapor at the eye of the pump impeller. This vapor is carried over to the discharge side of the pump where it no longer sees vacuum and is compressed back into a liquid by the discharge pressure. This imploding action occurs violently and attacks the face of the impeller. An impeller that has been operating under a suction cavitation condition has large chunks of material removed from its face causing premature failure of the pump. Discharge Cavitation occurs when the pump discharge is extremely high. It normally occurs in a pump that is running at less than 10% of its best efficiency point. The high discharge pressure causes the majority of the fluid to circulate inside the pump instead of being allowed to flow out the discharge. As the liquid flows around the impeller it must pass through the small clearance between the impeller and the pump cutwater at extremely high velocity. This velocity causes a vacuum to develop at the cutwater similar to what occurs in a venturi and turns the liquid into a vapor. A pump that has been operating under these conditions shows premature wear of the impeller vane tips and the pump cutwater. 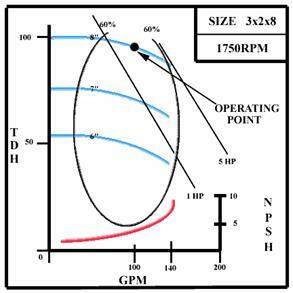 In addition due to the high pressure condition premature failure of the pump mechanical seal and bearings can be expected and under extreme conditions will break the impeller shaft. Suction Cavitation & Discharge Cavitation are extremely damaging to pump components.